Thanks for stopping by! We are passionate educators who love helping students in the Anthem and Seven Hills area. Reading, writing, math, SAT Prep—no problem. Kindergartners and seniors—both are welcome. We do it all. Since 2006, we have provided thousands of individualized education plans for students to help them achieve their potential. Struggling with math? Looking for enrichment? Our tutors and staff have you covered no matter your needs. First thing’s first: let us get to know you. Complete the form on this page to request more information and we will promptly return your call. Or, if you’re someone who would rather see us in action, stop by sometime and we’ll be happy to talk with you. We are located on S. Eastern Ave. in a standalone building you surely won’t miss (we think our signs look awesome!). Hope to talk to you soon! The tutors pushed me to improve my SAT/ACT scores, and the techniques they used will continuously help me in my education. I highly recommend the Tutoring Club. They have helped my grandson out greatly and we have noticed a great improvement in the areas that he needed help with. Staff is very friendly and helpful and the communication between staff and parent is great. Tutoring Club of Anthem/Seven Hills is proud to have Taylor Meador as its Director. Born and raised in Los Angeles, Taylor grew up working in her mother's 5th grade classroom where she developed a passion for education and mentoring early-on. She began tutoring when she herself was in high school, and continued to do so throughout all of her college years. She obtained her Bachelor of Arts Degree in Political Science from the University of Colorado. 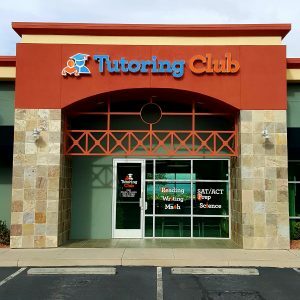 Taylor began working for Tutoring Club in 2015. First a tutor, she quickly moved up to become TC Anthem's Assistant Director. Today, Taylor is thrilled to be Director of Tutoring Club Anthem/Seven Hills. Taylor takes great pride in her role as Director and is driven by her desire to help all students succeed. She enjoys attending community events and getting involved with the local schools as well. When Taylor is not at TC she enjoys spending time with friends and family, live music, and keeping up with her two kittens.